Voting for the 2018 Scott Dunbier Awards concluded at midnight on January 31, 2019. Complete votes can be viewed on the voting page. Here are our 2018 winners. 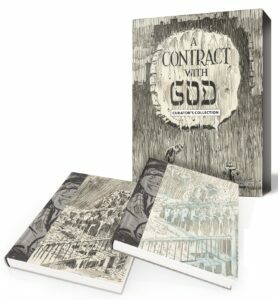 Will Eisner’s A Contract with God Curator’s Collection, design by John Lind, Kitchen Sink Books. Will Eisner’s A Contract with God Curator’s Collection, production by John Lind, Kitchen Sink Books. IDW, edited by Scott Dunbier. Will Eisner’s A Contract with God Curator’s Collection, edited by John Lind, Kitchen Sink Books. John Byrne’s X-Men Artifact Edition, edited by Scott Dunbier, IDW. Bill Sienkiewicz’s Mutants and Moon Knights… and Assassins… Artifact Edition, most purchased book of the year, IDW. A hearty congratulations to Kitchen Sink Books (an imprint of Dark Horse), John Lind, IDW, and Scott Dunbier. What a landslide for Will Eisner’s A Contract with God Curator’s Collection. A well deserved win for an exceptional work. This was our best year so far for voting, with between 242 and 330 voters per category. For some reason the first category always gets the most votes, so I’ll be changing up the order next year.